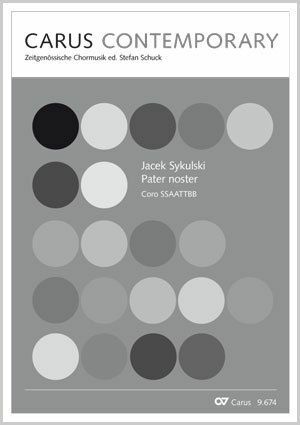 With the publication of his hypnotic Pater noster, Carus proudly presents Jacek Sykulski as a new composer in the "Carus Contemporary" series. Whilst Sykulski has achieved worldwide success as Director of the Academic Choir at the University of Poznan and the Poznan Boys’ Choir, as a composer he has remained a well-guarded secret until now. In his sacred compositions he combines in music the deeply Catholic-imbued tradition of his country with his own compositional technique, characterized by a tremendous vocal sensuousness of sound and a conscious use of tonality enriched by dissonance. His Pater noster was composed in 2009 and revised in 2015 for a performance by the RIAS Kammerchor in Berlin. The first section of this three-part work for eight-part choir (tenors and sopranos also split into three) begins with the invocation "Pater noster" homophonically in A minor. This then introduces the Gregorian liturgical melody of the Our Father canonically and aleatorically, like a contemplative congregational hymn. The middle section calls out "Adveniat regnum tuum" in increasingly insistent rhythmic declamation, more demanding, with hypnotic repetitions and intensifications. In the last section, Sykulski returns to the opening harmonies, but now a semitone lower on A flat, followed by an intensification at the words "sed libera nos a malo – and delivery us from evil" once more; this ends unresolved in a diatonic cluster on A flat as the paradigm of our imperfect earthly existence. The eight-minute unaccompanied composition is extremely singable, impressive, and not difficult to master. The piece is suitable for use in the liturgy, as well as in concerts and competitions.